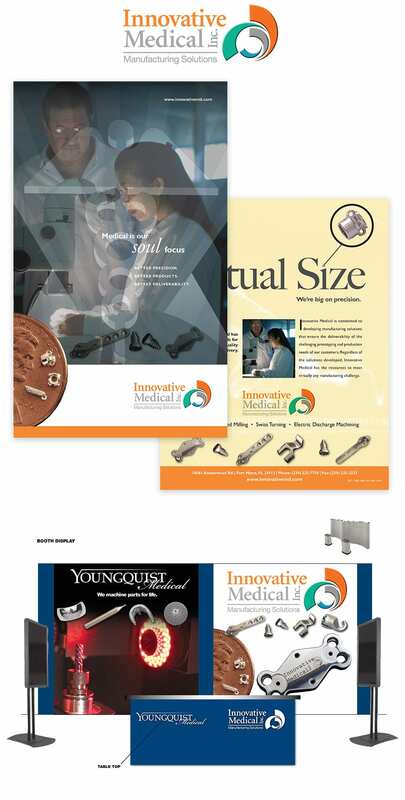 Sister startup companies Innovative Medical and Youngquist Medical hired Spiro & Associates to create marketing campaigns for a nationwide launch, to include brochures, websites, 3-D handouts, print ads, DVD presentations, interactive trade show booths and pubic relations activities. We highlighted the uniqueness of these medical implant device makers to position them as serious competition in a market with long-standing companies that are located in traditional manufacturing cities in middle America and the Northeast. These companies offered new ideas, the latest technology and the best technicians. To reflect that, we created a fresh and innovative look and feel across all collaterals to make them stand out in an industry that is typically portrayed as a catalog-type of parts-making market.